The Most Extensive How-To Scenery Library Available. We offer the most current publications related to model scenery, diorama construction, layout design, fine scale detailing techniques and a vast selection of topics you'll find valuable. Many of our Videos & Publication are 20% Discounted Everyday! 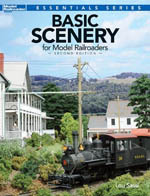 Basic Scenery for Model Railroaders, Second Edition by noted author Lou Sassi keeps modelers up-to-date on the latest scenery materials and techniques! Updates include working with foam scenery, concrete roads and other projects that show modelers how to apply a basic layer of layout scenery. Whether a beginner or advanced modeler, the step-by-step photos, ideas, tips and drawings will help you improve your model railroad's appearance! Softcover. 96-pages. ALMOST REAL by Josef Brandl - This book is a coffee-table style book, having a minimal amount of text and countless pages of full color images! A truly fascinating 204-page book! Basic Scenery for Model Railroad Scenery By Lou Sassi. This indispensable book gives you simple solutions needed to build scenery for a layout of any size or scale. Over 200 step-by-step color photographs and diagrams to demonstrate quick, easy, and effective techniques for adding realistic scenery elements to your model railroad. Close Out Special! - 'Beginner's Guide to N-Scale Model Railroad ' includes designing and constructing permanent and portable modules, reliable trackwork, control systems and realistic scenery and details. Close Out Special! Beginner’s Guide to Large Scale Model Railroading is the ideal way to start a hobby that every member of the family can enjoy. Watch this video and learn how to build an enchanted village that can be displayed year-round! Running time approximately 60 minutes. ALso available in VHS (WD1056). In this 96-page color publication, expert scenery builder, Paul Scoles, shares his techniques, tools and methods, taking you through the process of scenery building step by step. 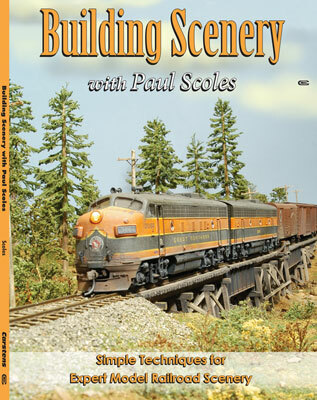 Enhanced with additional photos and text, "Building Scenery with Paul Scoles" puts years of scenery building experience right into your hands. Click image for greater detail! Watch this video and learn how to build an enchanted village that can be displayed year-round! Running time approximately 60 minutes. Also available in DVD (WD1055). VHS ONLY NOW ON SALE FOR 1/2 PRICE! SALE $9.99 WHILE SUPPLIES LAST! You'll save even more than you can imagine by learning the correct techniques the FIRST TIME! Save yourself all the costs and frustrations of 'trial and error" Series consists of all 7 DVDS: TM0111 Rocks and Basic Scenery, TM0112 Finishing Your Scenery, TM0113 Painting Model Structures, TM0114 Easy Weathering Techniques, TM0116 Building Waterways, TM0118 Easy Casting Techniques and TM0119 Building Landforms! Close Out Special! 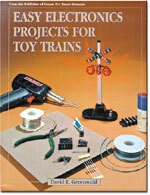 - Easy Electronic Projects For Toy Trains - Contains more than a dozen projects at the beginner & intermediate levels with step-by-step text, photos and clear diagrams. Learn more about electronics from bells & whistles, control panel lights, EOT flashers to constant lighting. Close Out Special! - Easy Lionel Layouts You Can Build - By Peter H. Riddle. Expert design tips for planning and constructing 29 Lionel layouts. 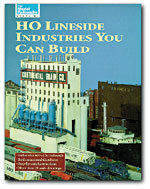 HO Lineside Industries You can Build - Add variety to your operating sessions. Have fun kitbashing. Select industries appropriate to the steam or diesel eras. Add variety to your rolling stock while serving these industries. Choose structures to fit the space available. Pick industries appropriate for your skill level. Build more complex buildings as your skills improve. HO Railroad From Set to Scenery By Rick Selby. 96 pages of how-to turn a basic HO train set into a complete 4 x 8 layout in 8 easy steps! .From Model Railroader. A collection of 22 HO-Scale projects. Learn how the experts kitbash, modify, and paint locomotives to make them look just like the prototypes. For any skill level - from beginner to advanced. From 'Model Railroader'. 120 pages containing instructions on constructing 18 projects!